If you want to grow grapes in your backyard garden, Concord varieties are a quality grape for beginners. The fruit is often used in juice, jellies and wine. However, Concord grape vines require a bit of care, including annual pruning to promote quality fruit production. The juicy grapes are well worth the effort. 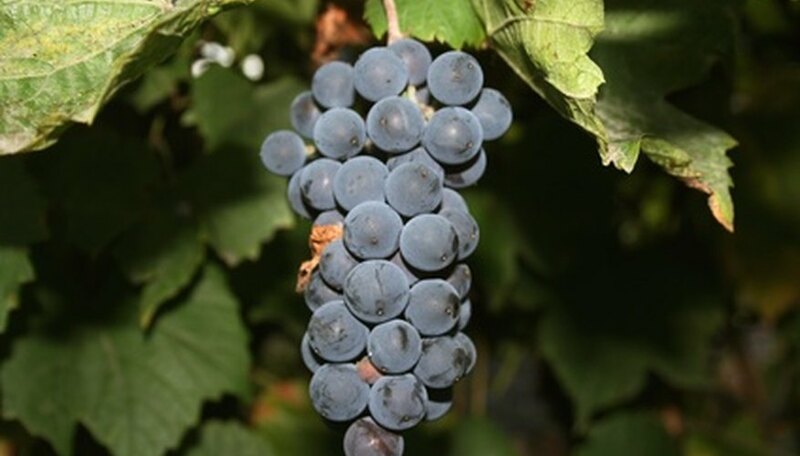 Plant grape vines in the early spring to establish the plants before cold weather comes. Choose a sunny location with rich soil and good drainage. Till in fertilizer or other organic matter for added nutrients. Dig a trench for the Concord grape vines deep enough to cover the roots but still allow the graft (the swollen section above the root ball) to be above the soil surface. For a trellis-style arbor, drive two garden stakes into the ground 4 to 6 feet apart and run wire between the stakes. Prune the grape vines to remove any dead branches or dried roots. Cut back the grape vines to a single cane. Find the soil line on the main trunk of the Concord grape vine to determine the previous planting depth at the nursery. Spread the roots and set the vines in the trench. Pack the soil around the cane at the same depth as they were grown in the nursery. Plant the vines 6 to 8 feet apart. Cut each single cane back to two buds. Water the newly planted Concord grape vines thoroughly. Mulch around the grape vines to help retain moisture and reduce weed growth. Maintain the grape vines during the growing season by watering each week to a depth of 3 to 4 inches. Weed as needed. Before the first hard frost of the season, add an extra layer of mulch to prevent soil heaving during winter. Prune the grape vines each year after the growing season is over and the vines are dormant. Cut back the grape vines leaving two fruiting canes. Tie the canes to the wire between the support stakes. Prune the two fruiting canes so there are 6 to 8 buds left per cane.